NIMMONDIGE NAANU: WILL THE MENACE OF CORRUPTION END? It happened yesterday in Chikmagalur District which is my 'Incharge' District. From 10 00 am to 1 00 pm, we had the review of Chikmagalur City Municipal Council. Then after lunch, inspected few places and then chaired a meeting to review the civil works progress at Datta Peeta. After the meeting, as I came down from the Deputy Commissioner's office, one of my friends brought before me a visually completely impaired person aged about 35-40 years. He was Chandrappa a villager from Tarikere Taluk. His Disability Pension has been stopped from July this year. He depends solely on this small amount of money. (Rs 1000/-per month) His many visits to the Village Accountant has not helped. Latest development was when one person approached this hapless man asking him to pay Rs 500/- to the village accountant as the necessary 'favor' to get the pension which is actually his right. Chandrappa has become desperate. This poor man somehow managed to reach DC's office at Chikmagalur and incidentally came to my knowledge. After hearing his sordid situation, I necessarily became furious. But instead of asking the DC to look into the case in the usual manner, I decided to take the matter myself. I made him to sit in my official car. I had a programme at Tarikere. I took this new victim friend of mine to Tarikere. On the way I came to know about his family and made him even to sing a song too. He sang a beautiful prayer song on Ganesha. But his Vighna had not been resolved yet. I had sent words to the local Tahsildar to make the delinquent Village Accountant to be present at my destination. 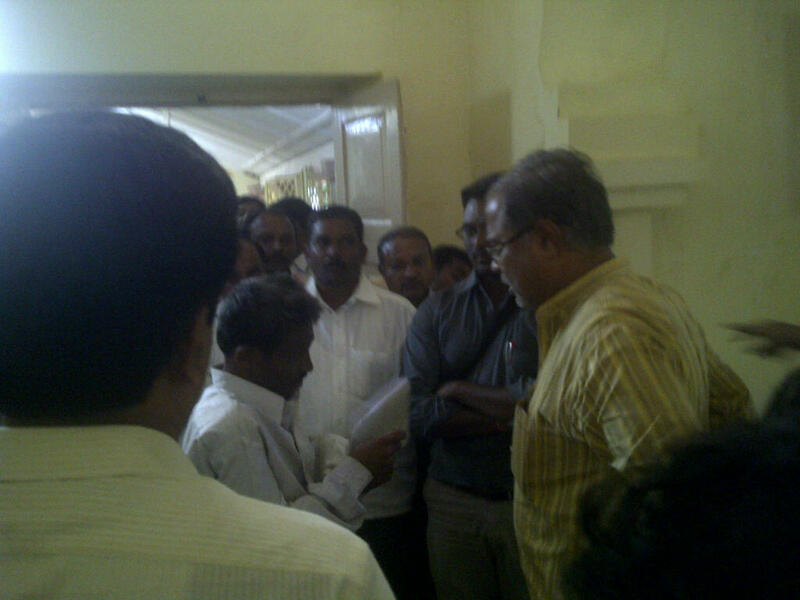 Once I reached Tarikere circuit house, I exchanged pleasantries with our local MLA friend Sri DS Suresh and other persons. After my informal Interaction with my press friends I came out and that VA was brought before me. He was a young officer with a very long innings in this Govt service lying before him. As I had planned I asked the blind man to offer Rs 500/- (given by one of my friends earlier) to the village accountant in front of more than one hundred on lookers and the team of Taluk Officers and the local MLA. Words are not sufficient to explain the situation in the Circuit House then. Everyone was stunned. The village accountant stood crestfallen. I just asked the VA, what if he himself was to be that blind man in that hopeless situation. After some initial blah-blah excuses, the village accountant fell silent. Then I turned towards the concerned Assistant Commissioner and Tahsildar (incidentally both were lady officers) to see that Chandrappa gets pension immediately and this should serve all those responsible in this social welfare schemes a lesson. Then the on lookers came and said that this is the best lesson one could teach to these heart less officers who make the people hapless. It is another matter that the Village Accountant will face necessary action and the disabled man will be sanctioned his pension immediately. But if I had lost my cool and had done some unpleasant act against that errant officer in my lost temper what would have been the immediate result. The whole story would have become a negative story by the next hour and the real human angle would have gone missing. Obviously Anna (yes, i meanAnna Hazare) has obviously not reached these merciless though young officers. The sight of the blind man and his bitter state of helplessness do not touch the chords even to the minimum extent. It may appear as a solitary solution to a stray incident. One may ask, what as a person in authority I am doing to cleanse the entire system. That question is very relevant and my answer is that I shall continuously send this message wherever I go and or I am in charge that these inhuman attitudes will not be tolerated. Yes for me Corruption more than anything else is 'Inhuman' pure and simple. I appreciate the way you have handled the whole situation. But in order to address the problem systemically, as Law Minister, I request you to please bring in the Right to Public Service Delivery Act immediately - like the ones passed by Madhya Pradesh and Bihar - and set up independent District Grievance Redressal Officers (DGRO) to whom citizens can complain about non-receipt of pensions or whatever else they are entitled to. This is what Anna Hazare is also asking. The DGRO should be able to penalise officials like your village accountant and even try them under the Anti-corruption laws. Congrats sir and we expect these kind of things in every Govt Dept's and by every Ministers . Highly appreciate your matured way of handling this issue. Hope it will send a humane message to the errant officers especially the ones interacting with poor and villagers. I feel, if government can put a display of the fees and service times for each of the services in all the public interface interfaces, it will empower the citizens to know their rights and reduce a corruption a bit. Sir, for differently abled people, you can influence private sector to create jobs. Tears of joy rolled down my cheeks as I read a report a report in the Indian Exppress and later hit your web site.Nearing eighty, being a journalist ,celebrated shastbdhi for my pen last year,we had been witnesss to the best of times. with Gandhians like Rajaji, kamaraj, nijalingappa, ,Kengal, we had been inspired by a host of writers in English,Telugu and Kannda, drawn sustenaces from philosophers like Paramacharya, Sarvepalli radhakrishnan, more importantly by my mother who used to wake me up with Dasarapadagalu, with Songs of Purandaradasa , kanaka connecting me to Lord krishna ,Great classics like Ramayana and mahabaratha inspired us.We are witness to the worst of times, living in the midst of the moral degradation , devoid of humanism and insenstiviness to the core.I felt elevated spiritually anmd morally when the report.May youir tribne increase.Being elder i can bless you and pray to God to give you a lonm life to serve the people who have no voice. Nice presentation, Well Documented with specifics. The art of contemporary writing is present in your blog. Good choice of words.